The Cross House has been through a lot. It was built as a private residence, but was later a tea room, an apartment house, motel, boarding house, and numerous fraternities and sororities. To accommodate all these changes a lot of kitchens and bathrooms were added. The above image is from 1999, taken shortly after Bob and Debbi Rodak purchased the Cross House. 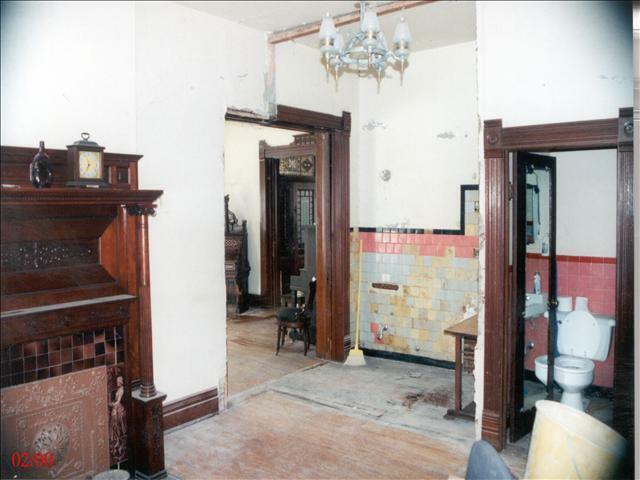 On the left is the remains of one bathroom, inserted in the library, which served the adjacent studio apartment (the original living room, to the left). On the right is an intact bathroom (which served the library). This bathroom, too, was later removed. The floor of the library. In the above image, you are looking at the remains of the two bathrooms. The holes in the floor were for the toilets. Note also the remaining floor tile to the right. I am posting this because next week this history will be swept away, when the flooring in the library and living room are redone/refinished. None of the visible flooring in the house is original. In 1894, the Cross House had the extraordinary luxury of wall-to-wall carpeting. As such, the wood floors were cheap random-plank pine. 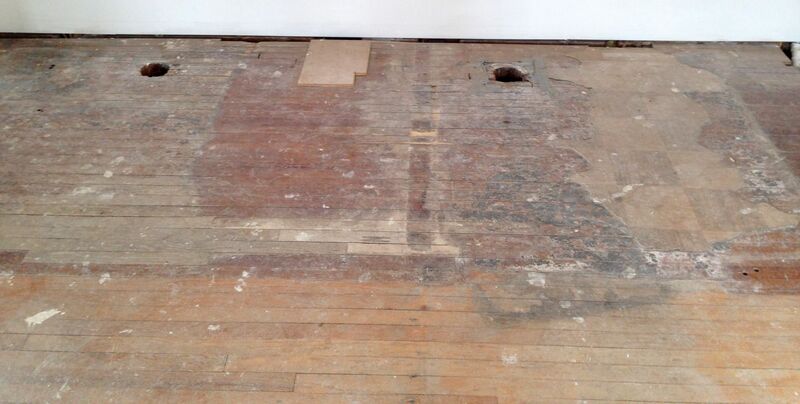 When the house was converted to apartments in the late 1920s the carpeting was torn up and plain oak installed. This flooring remains. I plan to retain the 1920s flooring, except in the library. This floor is so damaged that it will be removed. I have ordered custom-milled oak so that I can get the LONG lengths needed to match all the other flooring, and the exact width. While the library floor will be torn up and wholly replaced, what can be saved will be invaluable to repair flooring in all the other rooms. In short, I am sacrificing one floor to save all the other floors. While I am VERY excited to soon have two floors done and GORGEOUS in the house, I am a bit sad that a bit of history will be erased in the process. A history as evidenced in the above image. However, I am not so sad as to keep holes in the library floor! The above image will serve as witness. And I salute the very brave library floor for its great sacrifice. Great post. Can not wait to see the after. Be neat to see like a three sixty of a room. Do you take much video that could be shared? I can’t wait to see your new library floor, without potty holes! Good decision, Ross! It’s better to create a 2-dimensional album (or blog) than to save 3-dimensional sentiment that is no longer useful. Who is doing your new floor? Argh! I keep forgetting to click the notification box.